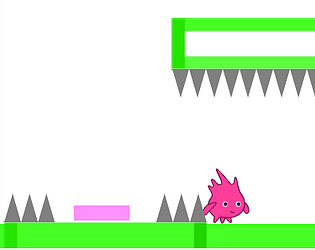 Manipulate the environment to influence the evolution of a population of critters. Free assets from scratch.mit.edu and some custom assests. The Gobos aren't the brightest true, but they aren't really supposed to be. Each Gobo's movement is entirely determined by 5 stats: their speed, how often they change directions, jump height, how often they jump, and how high the trampoline bounces them. If a Gobo's turn frequency stat is set at 1 turn every 6 seconds, then it will run to the wall and be stuck there until 6 seconds have passed, at which point it will turn around. That may be dumb behavior, but you can train your population of Gobos to turn around more often and avoid getting stuck by repeatedly putting spikes to the far right. That way the Gobos with short turn around times won't ever reach the spikes and will survive to reproduce while the Gobos with long turn around times will die on the spikes. The idea / concept looks nice. But I am bit dubious about the AI. The Gobos seem to always be stuck :p Good effort for the short duration anyway. The AI isn't the best... I'm not sure if I get the idea but I'm assuming we have to make the best path for the amazing looking characters to get to the area in the top-right corner.. . Hope to see more of this game (I couldn't get past the first level) - I like the concept.